Check out our checklist of essential items you need for your first apartment. Once you sign the lease to your first apartment, it can be overwhelming to think about everything you need to buy to fill the space. If your new apartment is unfurnished, it’s even more challenging to purchase everything you need, but at least you get to decorate the place however you like! Before you start looking at end tables and wall decor for your living room, it’s important to have a checklist of things you need on move-in day, vs. things that you can put off buying for a few months. 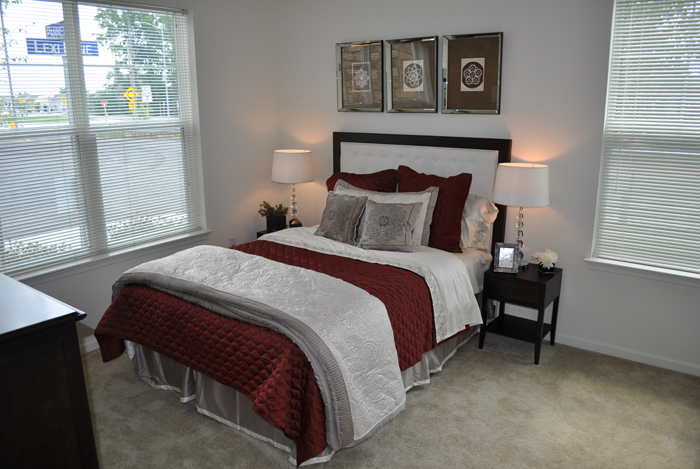 If nothing else, your new apartment should at least have a comfortable bed to sleep in! The last thing you want is to sleep on the floor or an air mattress for your first few nights, so buying a mattress is a top priority. A bed frame is also good to purchase ahead of time and can be found for an inexpensive price. Once again, you don’t want your new apartment to feel uncomfortable, so a couch should also be at the top of your checklist. If you plan on having friends and family visit and stay over and you don’t have a second bedroom, investing in a pullout couch is a great option. Next on the list is kitchen essentials, as you at least want the option of using your kitchen to make meals during your first few days in the apartment. If you are living alone or with one roommate/significant other, you only need a few pots, pans, glasses, plates, and flatware. Don’t be afraid to buy cookware that is a little more expensive and high quality, as they will be valuable investments you will use for years. You may not even think about buying window treatments, but they’re actually quite important and should be one of your first purchases. Curtains not only offer privacy, but also many your apartment feel finished and like a real home. After buying the essentials and getting settled into your new apartment, you can start to buy other items of furniture and decor to fill the space. This list should include items such as side tables, rugs, a desk, wall decor, and items for storage. If you don’t mind eating on the couch, you can even hold off on buying a dining table and chairs for a few weeks. This entry was posted on Wednesday, March 28th, 2018	at 4:46 pm	. Both comments and pings are currently closed.